Canal barge ‘ENDELLION’ | On the waterways of Europe. We’re still here in vibrant Paris as spring heads cautiously into summer. For the first time since our barging days commenced in 2008 we are sitting around on board going nowhere when the weather is warm, the waterways are inviting and most of our friends and neighbours have already departed for their seasonal joys. The past few months, since our last blog, have been erratic with health and events outside of our control. But, the Port de l’Arsenal, despite expecting us to have left by early April, have juggled our mooring position and continue to look after us. In March we visited Cornwall to spend time with my family when Stewart became ill and ended up spending a month in hospital, the latter part in the totally excellent Marie Therese rehabilitation centre in Hayle (west Cornwall). During his recovery period we could be tourists in our hire van, visiting St Ives, Falmouth, St Just and the fabulously diverse countryside of the far west of the British Isles. Google map showing our travels in the far west of Cornwall. It was also a sad but vital time to be with our Cornish family and friends. View of St Ives harbour from the St Ives Branch Line train. Hayle harbour at the bottom of the tide (which seemed to be most of the time!). The wonderful King family (my father’s side) at the Hawkey family pub, The Cornish Arms, Pendoggett. The exotic Trebah gardens at Mawnan Smith in Cornwall. Wandering the hilly Trebah Gardens in the sturdy Invacare wheelchair. The invaluable Marie Therese House, at Hayle, provided excellent support for Stewart. Later I returned to the west-country (Stewart managed perfectly here in Paris) to be with my ‘little’ brother Jonney and separately (as they run a pub and can rarely be away together) with his wife, my dear friend Felicity. We chose to stay in the west of Britain, in Devon and Somerset starting on the south coast at Dartmouth. We needed rest and solace after our remarkable and adored mother, Joan Hawkey, passed away the month before. We took long and brisk walks over the hills of the south coast of Devon and up onto Dartmoor , then across to the north coast where we drove along the cliff-hugging toll roads around our base at Porlock (also view the webcam at Porlock Weir). It was a treasured time together. 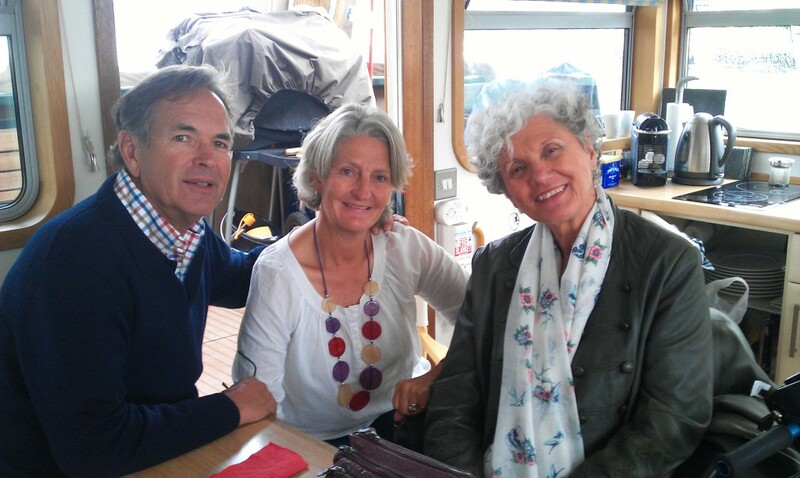 In the past week, here in Paris, we have enjoyed time with Stewart’s brother Ian and sister-in-law Pammie who stayed on board a few nights before heading off to the Burgundy countryside to investigate farming in that part of France. With a large sheep and cattle farm in Australia (near Goulburn), and taking the first overseas holiday in more than 25 years, Ian can’t be too many days out of touch with farming, it seems. However, he coped with the tiny bunk room on board Endellion – and what better place to be, if you have to be in a city, than here in the heart of Paris? We’ve relished a BBQ on our stern deck, the low-key cafe life of the Bastille area (11th, 12th, 3rd and 4th arrondissements), and visited a few of our favourite haunts together. Ian, Pam and our friend Anik. 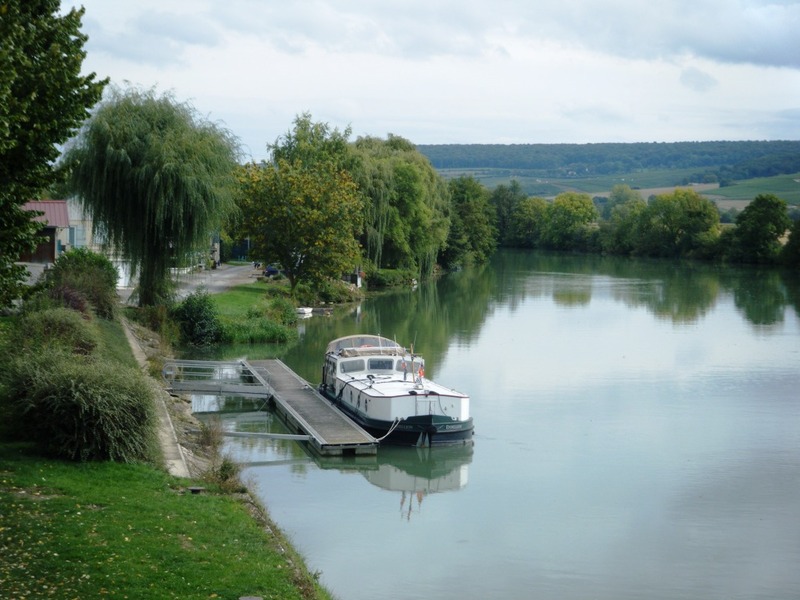 Meanwhile, we keep attuned to the travels of our friends and fellow boaters by reading their regular communication, reliving our journeys on the same waterways, such as the blog from Guy and Marlene, Le Chat Lune, who left Toul a few days ago having arrived via la Meuse. They should be crossing paths right now with Kay and Josh on board Peridot who have just left Nancy and are heading for the canal des Vosges. 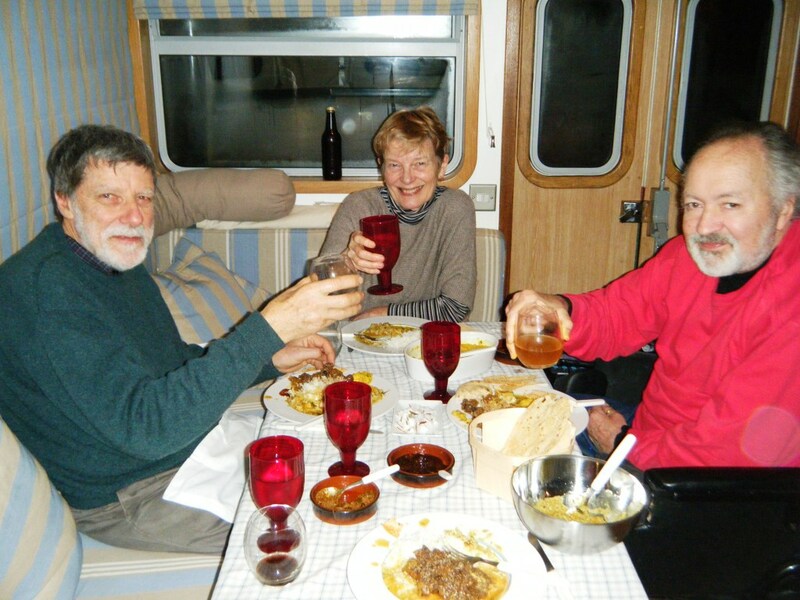 Judy and Charles on board Anna Maria report in regularly as they head north for the Netherlands. Sue and Ulick on board Quercy have disconnected from us (they were moored to our side for the winter) and departed heading south for the Burgundy canal and St John de Losne. Anna on board Isabelle tells us she will be heading to Meaux along La Marne by the end of June. And the rest of us long-term port de l’Arsenal boaters will probably slowly trickle off to La Villette, around six kilometres away, up the canal St Martin. Our plans are still on track to return to Australia for six months (at least) from October .. meanwhile we are looking forward to a summer in Paris, or nearby. We’ve had a mild winter and all around us in the port (de l’Arsenal) here in Paris we are seeing signs of spring: daffodils popping their yellow heads, cherry blossom in brilliant pink, the catkins (lambs tails) have been waving beside us in the park for many weeks. It’s been a very mild winter and hopefully it’s now too late for a big cold snap. During this pleasant spell Stewart has revisited one of his loves, cooking Sri Lankan curries and below he tells how this all came about and shares some of his recipes. I was introduced to Sri Lankan cooking 40 years back in of all places Rockhampton, Queensland. “Rockie” calls itself Australia’s beef capital and along with all the wheat, cotton, sorghum, coal and pineapples, our beef cattle out on its hinterland it sure is. I was sent up there to be the reporter for the ABC’s Rural Department in around 1974. I had to fill a 20 minute “Country Breakfast Session” broadcast live at 6.30am, five days a week. The CSIRO’s research tropical cattle station was always a fertile source of stories and boasted one of the first computer aided research projects; operated by a very gentle Englishman called Joe. Joe had served in the British Army in Sri Lanka – though he hardly looked or sounded like a soldier. Away from his office he wore a sarong and hosted sumptuous curry lunches in his caravan, where we all sat around the spread on cushions on the floor and wolfed down his creations with our right hands. Largely thanks to the interest Joe had kindled, around 30 years ago I did a trip to Sri Lanka and learnt more of the culture and of the secrets of cooking, their style. One of the main differences between Sri Lankan cuisine and Indian or Pakistani, is that on the Tear Drop Isle each spice must be individually toasted before grinding and combined into a powder that smells so intoxicating it’s hard to believe it’s legal. The first step was to top up our supplies of all those spices. That meant a short trip over to Paris’s Indian precinct around the Gare du Nord, where the smells of spices, the clothing, language and things for sale in the shop windows makes it hard to believe you are still in the middle of Paris France, rather than say Chennai or Colombo. Fresh ginger, lemon, chilli, curry leaves and turmeric. Fresh cod from the local markets. In Sri Lankan (Ceylonese) cooking, one of the main characteristics is that the spices are dark-roasted. This gives them an aroma completely different from Indian curries. So, if you want the quick method be sure to use curry powder that is labelled ‘Ceylon curry powder’. If you cannot buy it ready-made, here is the simple recipe I use. In a dry frying pan over low heat, individually roast the coriander seeds, cumin seeds, fennel seeds and fenugreek seeds, stirring constantly until each one becomes a fairly dark brown — do not let them burn. Place the roasted spices into an electric spice grinder or use a mortar and pestle. Break the cinnamon stick into small pieces and grind with the cloves, cardamom and curry leaves until you have a fine powder. Add the chilli powder and rice flour (if using). Store in an airtight jar for up to three months. It was agreed on the night that the favourite dish was the fish. I was guided by Charmaine Solomon’s “The Complete Asian Cookbook” which I’d downloaded onto my laptop as a Kindle book for $11.00, much cheaper and lighter than the big heavy tome we have back in Sydney. Below is the recipe, though I added a couple of teaspoons of brown sugar (as we had no palm sugar) which really topped it off. Wipe the fish with damp paper towel. Rub each fish fillet with turmeric and ½ teaspoon of the salt. Soak the fenugreek seeds in 60 ml (¼ cup) water for 30 minutes. Put the fenugreek seeds into a saucepan with the onion, garlic, curry leaves, thin coconut milk and the remaining salt. Simmer gently until the onion has softened, stirring well. Add the fish and simmer for a further 10 minutes, then add the thick coconut milk and cook for a few minutes longer. Remove from the heat and add the lemon juice, to taste. Serve with rice and sambols. Solomon, Charmaine (2011-11-01). The Complete Asian Cookbook (Kindle Locations 3835-3848). Hardie Grant Books. Kindle Edition. We now have a supply of Stewart’s special Sri Lankan Curry Powder (prepared on board to the above recipe) and any day now he will be pulling out the pans and cooking up another treat (I’m thinking lamb .. mmmm). Although, with spring so present it might not be too long before all we want is salad! We’re now very happily back in Paris after our mad dash around the world, not easy especially with a wheelchair .. or two. Using every form of transport available to a wheelchair user we started from Paris with the manual wheelchair (the service people in France were unable to repair Stewart’s fabulous Invacare GTX SR) using the excellent Eurostar train to London. Then we took Virgin Atlantic to New York for three nights where we collected Stewart’s ‘new’ (second-hand) power wheelchair. On again with the two chairs using Air New Zealand from New York via LA to Auckland. During our five-day stay we took a light plane north to the Bay of Islands and then taxi from there to Kaipara Harbour (over 100 kilometres back south west) and from there another taxi into Auckland (100 plus kilometres south east). The Google map to right shows our route and most destinations. Meanwhile Stewart’s new power chair was sent to Christchurch for modification so he was back in the manual chair. Just to mix it up from Auckland, still with the manual chair, we flew with Emirates to Sydney where we collected a hired power chair and used the Murray’s bus (only recently made wheelchair accessible) to Canberra for just over a week. Then we took the country train to Goulburn for four days and on again with the same train service to Sydney. At every connection we had to use taxis given the amount of bags we had with us as well as, at times, two wheelchairs. Never again .. we both said. The best way to travel: Eurostar. Ramps are always there with helpful support. Good space and no chair changes required. Inside the tiny Dash 8, the problem was getting off it. They used a fork-lift device! A hole in the side of the Murray’s bus. The lift was rather high up. And the lift was a long way down. Canberra taxi service, good as long as booked well ahead. A manual ramp was put into place for the Canberra-Goulburn-Sydney train. The country train service was a good experience. Disembarking at Goulburn, everyone watches. Stewart points out the mistake Emirates made, did they really think he could get into the seat in that space? Stewart, Brian and Joanne inspecting the costly recently renovated stairs at Hawkesbury River. Another project of Stewart’s. So, in keeping with the mood of our rushed tour, here are some of the highlights as we remember them! In amongst the rather depressingly dark, sun-starved streets we found a brilliant event, Twelfth Night with Mark Rylance and Steven King. Great entertainment, from watching them dress on stage to the brilliant all-men cast (just like in Shakespeare’s day), we loved it. Also a short but high quality visit to the Museum of Modern Art (MoMA) and seeing some of the works from our favourite artists. We were lucky to find Mohummad, our taxi driver, because he was kind enough to look after our new power chair to be collected by a Christchurch-based company to modify the wheels (softer, bigger tyres). He made sure it was collected after we’d left for Sydney, and had the modified chair for us when we arrived back in Auckland, thank goodness. From Auckland we took a light plane (interesting for Stewart and his manual wheelchair) north to KeriKeri, Bay of Islands, where we toured the very old haunts of Stewart’s ancestors on his mum’s side, the Shepherds. We had a great night out with Ken and Rhonda Blakie, fellow European waterways boaters who sold their barge last year and have ‘retired’ nearby. Returned to Auckland via Kaipara Harbour where friend Sam Hunt lives, using another excellent taxi service owned by Alec. Sam told us we had to stay at his local ‘pub’ a totally charming, small B&B, Matakohe House, a great find (thanks Sam); it’s owners Alex and Lyn are the best hosts imaginable, great food and enormously caring. We took a trip on the ferry but the ramps were very tricky. The huge Kauri Museum, at Matakohe, Kaipara Harbour. The Capital of Australia, and where Stewart was born and his mum Jean lives. The focus of our trip this year was all about family, spending time with Jean, Uncle Bob and Aunty Roma was at last the treat we were waiting for. With Jean we enjoyed discovering in Canberra one of Jamie Oliver’s Italian restaurants, which had opened the day we arrived – his chain is certainly expanding rapidly. Jean, Bob, Stewart and Roma at the Mercure Canberra. There had been fires along the railway line Goulburn to Sydney, but happily all over now. Canberra to Sydney railway line has many significant bends in it! Lovely old station buildings, Goulburn. Bird nesting was all around us at Connen Hill. Connen Hill view across the property from the homestead. It was a longish stay in Canberra and luckily we found one of the best hotels we’d ever experienced, Mercure Canberra, which opened in 1927 (as Hotel Ainslie) and keeps much of its original architecture (beautifully low-rise) and rightfully is classified by the National Trust. Incredibly, when we asked for the bed to be a little higher, first they placed an extra mattress beneath but this made it a little too high. No problem, they searched around and found longer legged casters and changed them all. The result was a bed at the perfect height. The bathroom also was a unique experience complying fully with the international access standards. We ask, why can’t other hotels around the world achieve this? A train trip of less than 100 kilometres towards Sydney took us to Goulburn, and around 20 kilometres from town back along Lake Bathurst Road is Stewart’s brother’s family property, Connen Hill. Here we could enjoy our most relaxed and happy time with family. Again the bathroom and bedroom were the easiest to manage. Our final destination in Australia was our home city of Sydney. 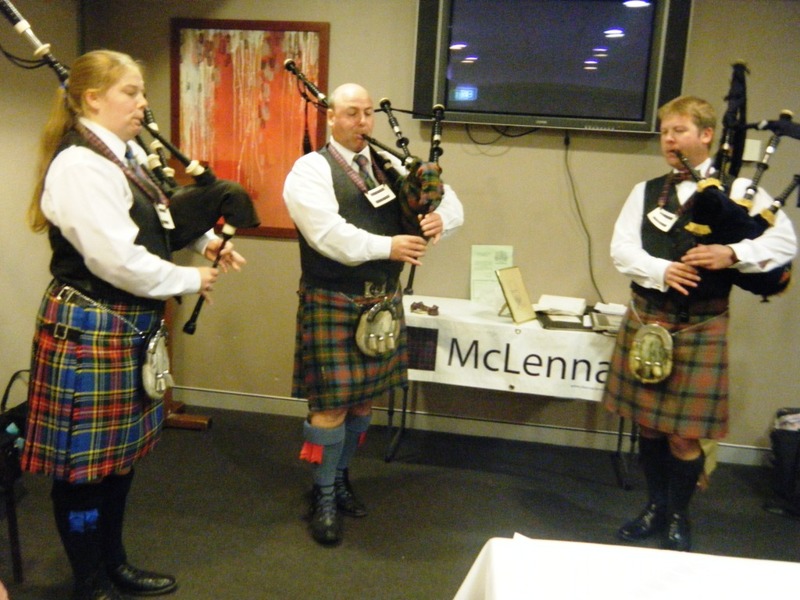 Far right: Ruairidh MacLennan of MacLennan and fellow pipers of the Sydney branch of the Clan MacLennan. Since our apartment has a happy tenant and we were to stay only 10 days, we booked into the Sebel Surry Hills. Not a pleasant hotel, but the Surry Hills area is probably the most vibrant and interesting area of Sydney these days. It was the ideal base for the many gatherings with Sydney-based friends and family, finding an arty and interesting cafe or restaurant was easy. Also, using the modern and friendly library with free WiFi, window shopping and ambling the historic streets, to fill in between meetings, were thankfully excellent options to being within the hotel. The family gatherings in Sydney included a special meeting of the Sydney members of the Clan MacLennan, with guest of honour Clan Chief Ruairidh and his fiancé Gillian, over from Dores near Inverness in Scotland. Surry Hills smart cafes and restaurants. Streetside cafes of Surry Hills. Interesting rooftops of Surry Hills. A model of Barangaroo, Sydney, a controversial development site which needs big lobbying to stop James Packer build his mega-tower come casino. Finally, after the long haul from Sydney returning on the same route we arrived once again in London, staying for two nights. The Victoria and Albert museum was a treat spending most of our time on Level 6, their recently reopened huge furniture gallery. Meeting with our friends Lesley (London) and Graham we revisited old haunts around Limehouse: A drink at the Narrow on the banks of the Thames, eating delicious Chinese further down river; Giggling over the antics of the London Black Cabs as one broke down before we could depart in it, the second didn’t have a ramp for us, finally we found one but it set the frequent challenge of getting into it. Some Black Cabs are too narrow for Stewart to place the wheels of the electric wheelchair without them being on the space where the ramp folds back after use. We therefore have to open the far-side door, drive the chair until the foot plate projects out of this door, fold the ramp back into the floor, and then reverse the chair so it is no longer projecting into the road and both doors can be closed. 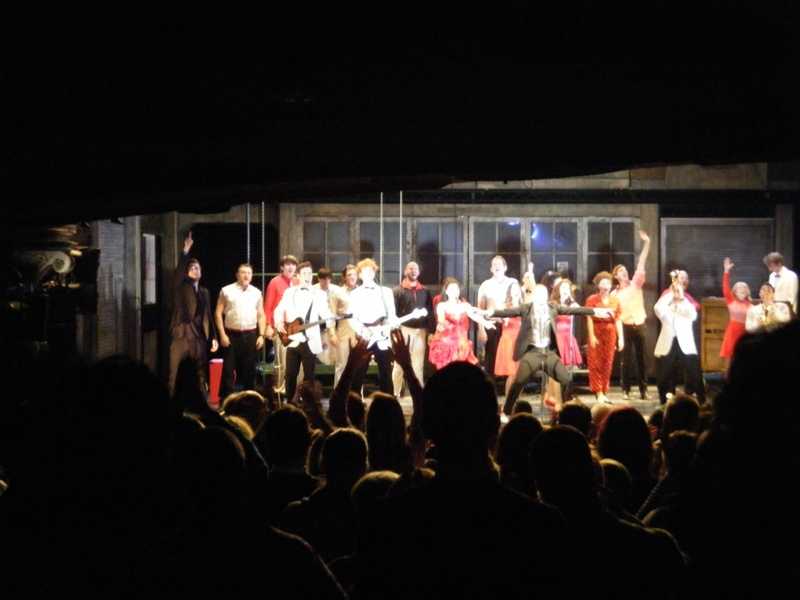 Roddy Doyle’s The Commitments – our expectations were too high. On our last night before ‘home’ in Paris, we were excited about the big show we’d built high expectations for, Roddy Doyle’s The Commitments at the Palace on Shaftesbury Avenue. Great venue, but we were disappointed with the show. We think we’d expected too much .. and by now we were more than ready for home. As Stewart often says, in years gone by many Japanese tourists travelled with their cameras on whistle-stop tours and really didn’t have a ‘holiday’ until they got back home and experienced everything through their photographs. That’s a little like we feel about this trip to Australia and back, and we only have ourselves to blame! We’re recovering well .. loving being back in one of our favourite places, Paris. 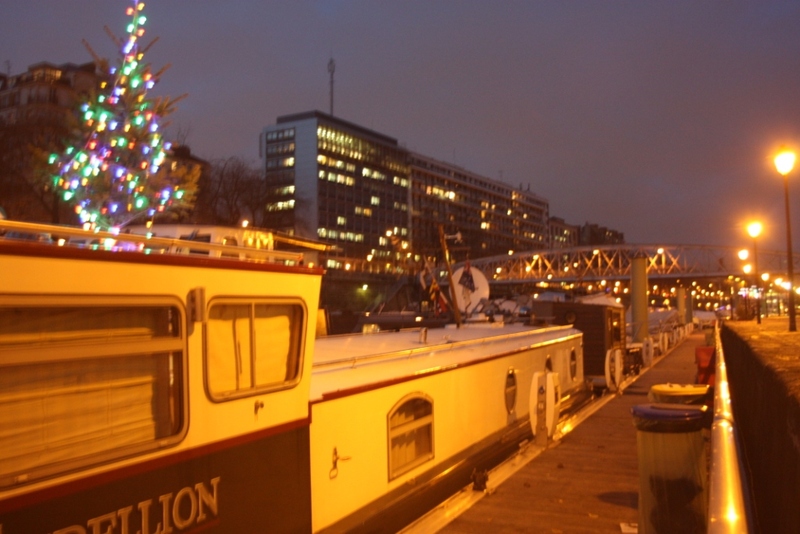 Happily moored at the Port de l’Arsenal, Christmas tree merrily saying “Happy Festive Season”. Our Christmas tree and lights are up although it won’t be long and we will be travelling again. This time, by train only, to Cornwall and the Hawkey family Christmas celebrations. We will be staying in ONE hotel, inspected on our last visit to Cornwall, and so we know exactly what we will have to deal with! We wish everyone a happy festive season .. and all the very best for 2014. 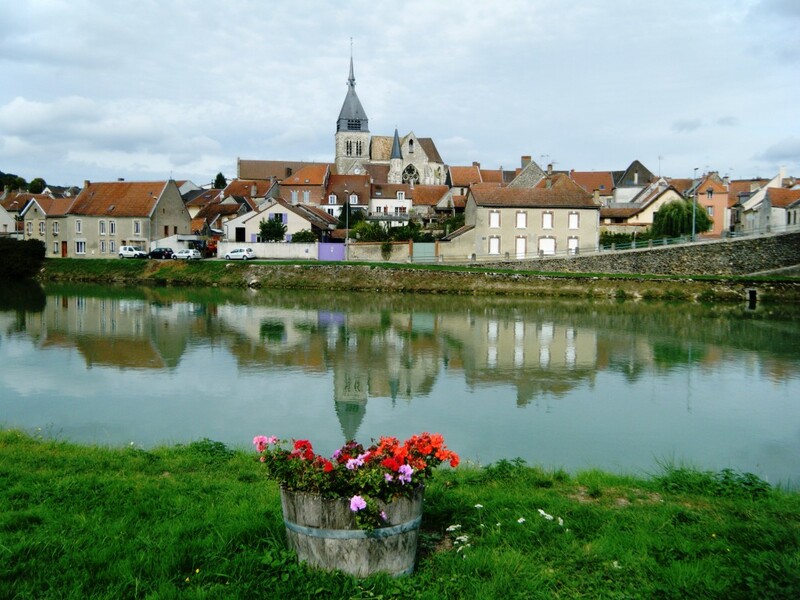 Last year (2012) we passed along the fabulous Marne Valley, cutting through the geographic middle of the Champagne region, when everywhere was relaxed and often closed for business. That was because it was late November. The grape harvest (vendanges) was successfully behind them, the pressing finished for the season and the proprietors were planning their skiing holidays! Vendanges (grape harvest) at Charly and all along La Marne. This year the grape harvest was still ultra-active in the Marne Valley during early October as we passed through, and what a delight it was. 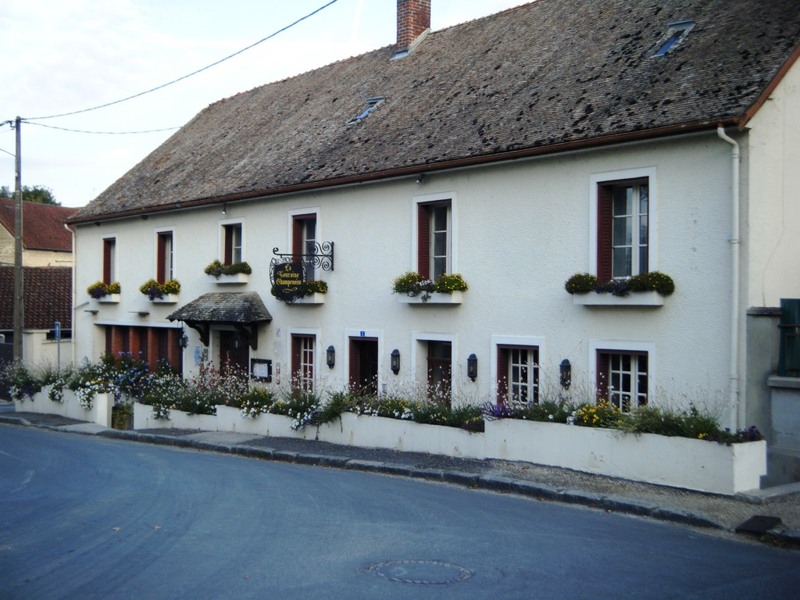 Walking around the villages (Sillery, Damery, Dormans, Charly) we saw life ticking along at a much faster pace. The streets were full of tractors with trailers behind carrying crates of freshly picked grape clusters; there were queues to use the bins provided for the remains of the pressing; there was much hosing down of roads and yards where the juice had been flowing from the collection bins; white vans flew across bridges in the early hours of the morning full of what we’re not sure but probably tools of the trade. Whilst in fields the white vans were sitting dotting the hills, buses parked almost at random having delivered the pickers from the relatively nearby camping grounds. Every town and village had new temporary communities in their caravans, campervans and tents – they seemed to have popped up where last year there were none. Passing through the lock at Mareuil we see grape picking up close. Mareuil lock-keepers house surrounded by grape vines. After pressing the grape clusters they are carded or used for liquors. Andre Goutorbe winery note to pickers showing where to go. Van with grapes just picked. After pressing the grape clusters, queues for the bin. After pressing the grape clusters removal. Stewart with grape juice lorries. Vendanges activity on hills one misty morning. Vendanges activity, like the front garden. 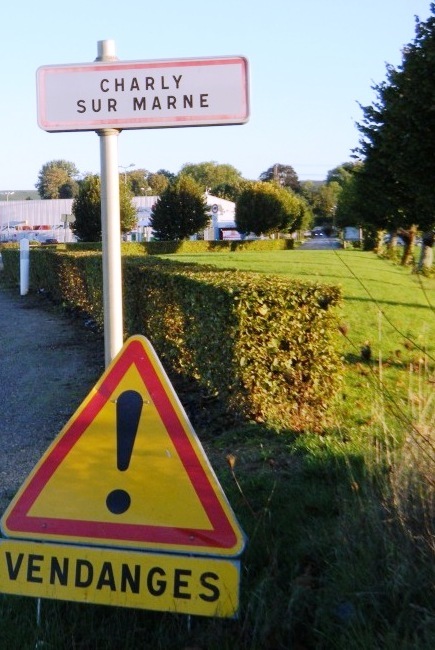 Sign explaining closed for vendanges. In the wonderful town of Damery we were surrounded by campsites but rarely saw the squads of workers who must have been there somewhere .. no doubt up in the vineyards spread around the hills. Across the bridge from our mooring we found the restaurant Au Bateau Lavoir and headed there for an aperitif one evening. There was a concrete paved terrace surrounding it with empty tables and chairs which we had to wade our way through to find one big step into the restaurant. We thought we’d have to stay outside, but we’d been observed and a lady came out and said she had a ramp. This consisted of two sturdy sections of aluminium which she could lay down as a track up the step. So with a bit of a struggle and help from her and some fellow customers in we went. 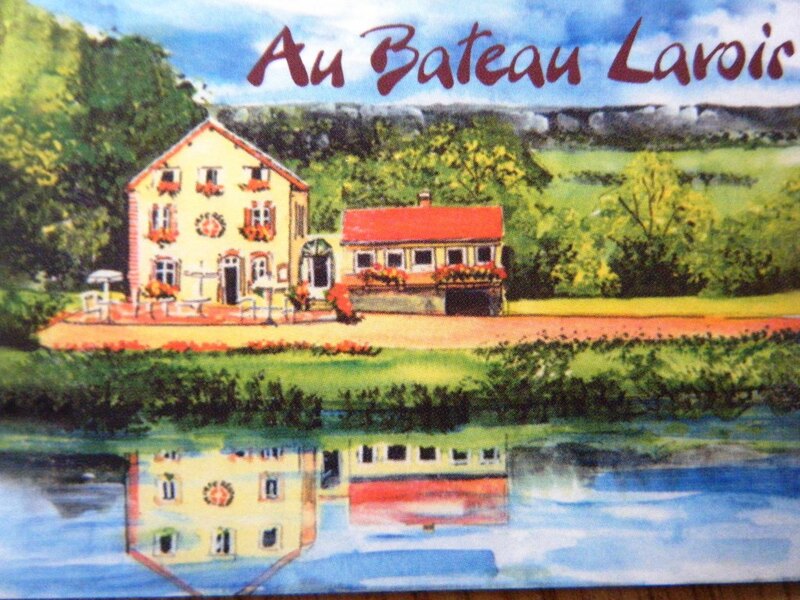 Photo of the Au Bateau Lavoir business card, as delightful as it looks here. Naturally we ordered a bottle of Champagne (choosing one from the vineyard of the Proprietor of the restaurant) and sat and enjoyed the ambience. Soon after a couple arrived and went up more steps to what looked like their restaurant section with many tables set for dinner. A local, standing at the bar with beer in hand, called out to Madame (we later found out this was Beatrice and the wife of the proprietor) who’d disappeared around the back, “you have customers up there” (in French of course). The newcomers were Americans and from their conversation with Beatrice we heard they weren’t sure which Champagne to order. Noting some language difficulties between them we invited them to taste a glass of ours. From then on, Ed and Carole spent the next few hours with us. Lesley, Carole, Janie, Ed and Stewart at Au Bateau Lavoir. In between times it seemed the pickers and other workers from the vineyards had returned, mostly sitting outside on the terrace looking rather jaded and in need of refreshment. One ordered a glass of something that was bright green .. a startlingly bright one. I asked Beatrice (in my French) what it was but she couldn’t understand me .. and pointed out that verre and vert (glass and green) are pronounced the same way .. but still she couldn’t understand me, until she realised I’d said boisson (drink) and not poisson (fish)! More work required in French language study. Damery from Au Bateau Lavoir. We weren’t planning on eating at the Bateau Lavoir or staying out late into the dark. Stewart’s loan chair was not behaving: It was difficult to manoeuvre and the batteries had no life so would become flat after only a few kilometres. Our new friends, Ed and Carole, had also not intended staying long as they had to drive on roads unknown into Paris to their hotel. But none of us would have missed the fun of our meeting for the challenge of getting ‘home’. We heard via email that they made it safely (despite the unfamiliar roads) back to their hotel. However, Stewart had a bigger challenge in the dark. First we had difficulty getting out of the pub on the two sections of ramp, then over the bridge with the wheelchair batteries beeping because they were almost flat, and finally there was just a tiny ledge, barely as wide as the chair along the water’s edge for Stewart to use to get to the pontoon and on board. We made it! The following morning we bought six bottles of Champers from Beatrice: ‘Remy Payer’ selection Brut at 13.50 euros per bottle. When I asked her if she could recommend a taxi to take us to Hautvillers (the nearby village famous as the home of Dom Perignon and his Abbey) Beatrice said, “I will drive you”. What time she asked. And so at 11.00am we pottered across the bridge with Janie pushing the spare manual chair and Stewart in the power chair. Beatrice driving us to Hautvilliers (Janie’s photo). (Note: there were no wheelchair accessible taxis in this region, and in most of France, which would have enabled Stewart to stay in his chair, so the manual chair was essential as Stewart could transfer into the passenger seat and fold the manual one into the boot). The power chair was left in her garage. Opening the press manually at the Hautvillers Pressoir. Turning the grapes and pulling them into the centre to gently recrush. 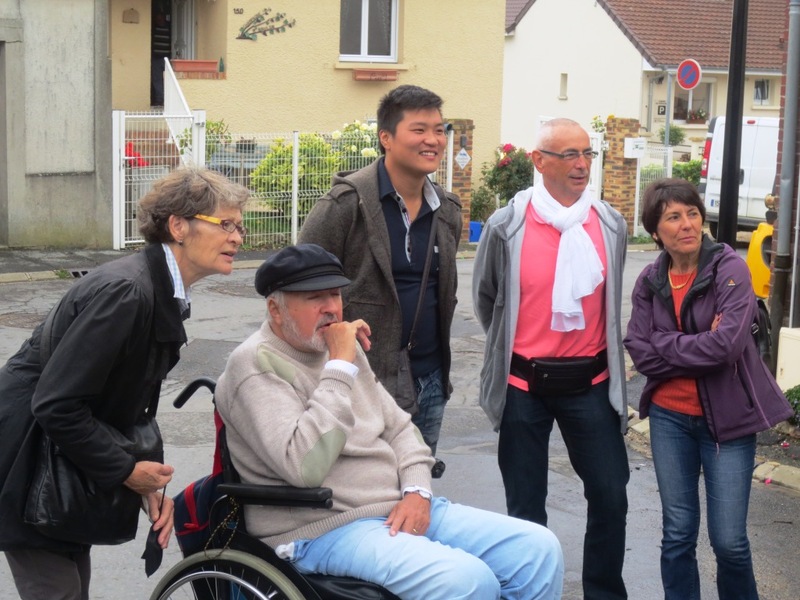 Beatrice didn’t just take us to our chosen destination; she took us on a guided tour first into the neighbouring riverside village of Cumiers – a place that we couldn’t stop at because the pontoon was not wheelchair accessible. We toured around the back of the village along the river bank to see the iron sculptures telling the story of the Champagne seasons. She took us past the tourist boat we’d seen running up and down the river with us these past four days or so .. Beatrice pausing to chat to the owner of the business as their cars passed window to window in the narrow roads. 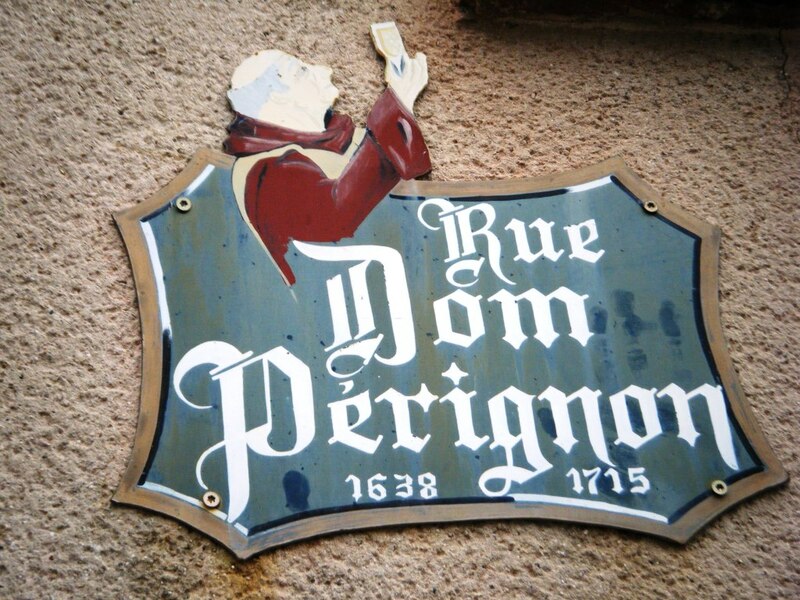 Dom Perignon street signage at Hautvillers. 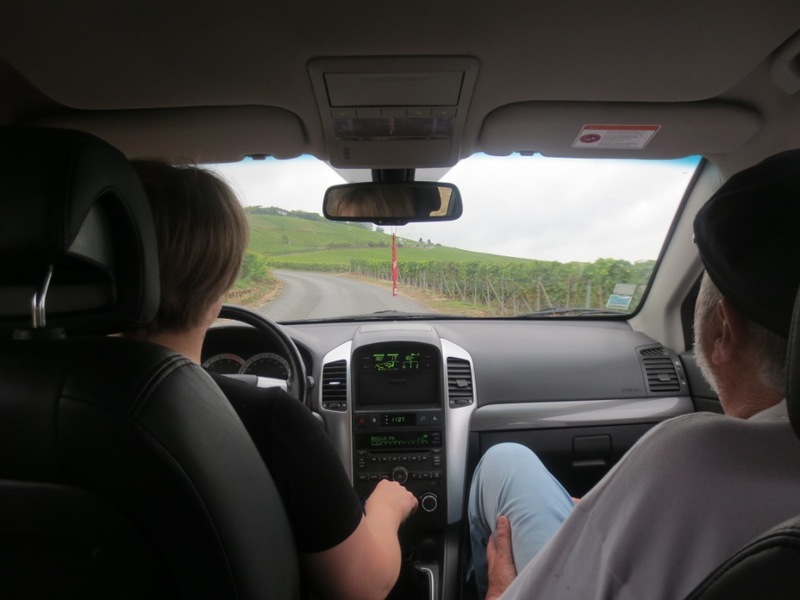 Then on up the hill to Hautvillers with vineyards coming right down to us as we drove along. Beatrice pointed out “this is the end of our vines here, these on this side have been picked already,” etc. Finally she drove us to the spectacular view and around the village of Hautvillers to ensure we could see it all by car. She stopped, eventually, by the tourist office with a promise to collect us if we had any difficulty finding a taxi for the return trip. Remote controlled aerial device for video making, at Hautvillers. The tourist office (with a rare helpful person) suggested we visit the Pressoir we’d passed with Beatrice in the car. To our surprise outside the pressing room there was a man operating a ‘drone’ as Janie called it, an unmanned aerial device, remote-controlled, with camera attached. A Korean man said hello and asked if we’d like to look inside. Yes, of course and how lovely of him (thinking he was a tourist like us). 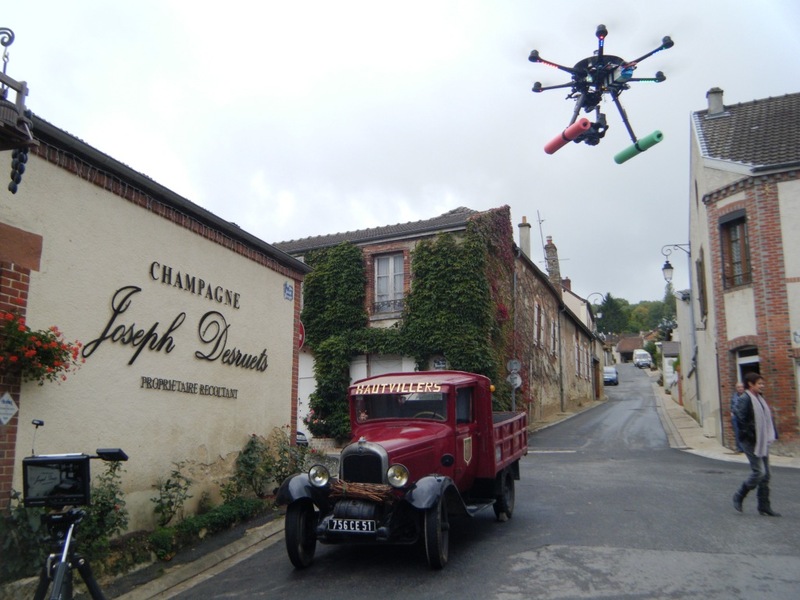 He told us the flying camera was making a video about his winery.. explaining that he and his brother were originally from Korea and had been adopted by a French family, this was their winery: Joseph Desruets. He stepped inside with us where there was an ancient press in action manually operated turning the grape clusters over and pulling them into the middle and gently presses them again – seven times a day on the hour. This old press, made of oak, was built in 1885. On the matter of statistics, during this frenzied period of pressing and bottling across the Champagne region they are producing 268,000,000 bottles generating around 4.4 billion euros – around 55 percent of it being consumed within France (from Comité Champagne, a trade organisation established by statute to manage the common interests of Growers and Champagne Houses). We made it safely back to Au Bateau Lavoir via taxi where Beatrice was waiting outside with ramps down so we could once more enjoy the restaurant and say our thanks and farewells. We will definitely be back. Another favourite place at Damery, having visited it last year, was Andre Goutorbe Champagne house where their new tasting room was open and as we entered, to be predicted (the Belgians are the fifth largest international consumers of Champagne), there was a table full of tasters from Belgium. We told them in English the story of their compatriots who last year bought 24 cases! No pressure we said. Man stops to watch us as we potter beneath. Pushing the Marne river, we are gliding down. Le Bac restaurant (the ferry) at Charly. Janie and Stewart at the restaurant Le Jardin Provencal in Meaux. We had several more delightful stops before we were almost at the end of the Champagne region and entering Brie country. We were happy with our stock of Champagne, sitting underneath Janie’s bed waiting to be shared during the ‘festive season’ back in Paris. We were almost exhausted with our growing knowledge of the art of Champagne making and drinking. If you too are interested in this amazing money-making engine we can recommend the Comité Champagne website: http://www.champagne.fr/en/champagne-economy/key-market-statistics. Apparently the wine market for France, both its own consumption and exports, has been in decline – all except the market for Champagne and perhaps some of the elite brands of red and white (source Wikipedia: http://en.wikipedia.org/wiki/French_wine#Trends) . The last few days of our journey down the Marne into Brie country (and the lovely mustard of Meaux) were also, and as usual, packed with events. 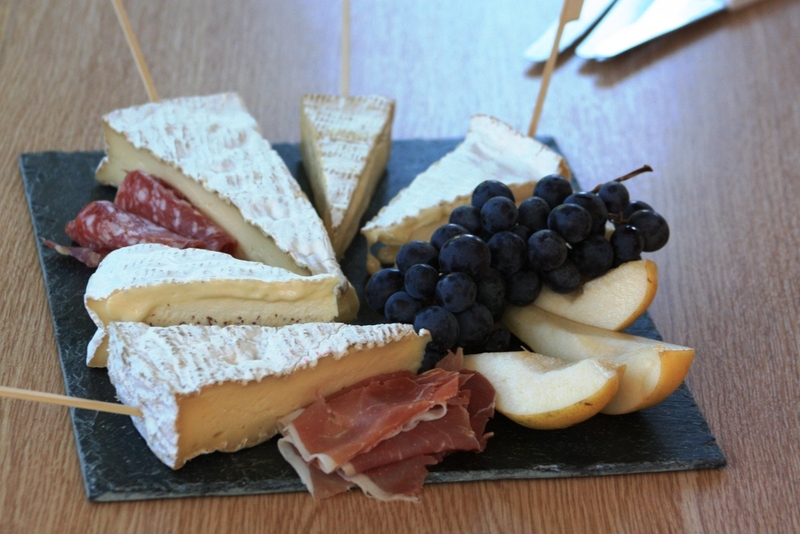 Five varieties of Brie, purchased at Meaux, for our Brie taste-off. Chiefly they related to the boat. With leaves now falling we had blockages in our engine water cooling system below the filter which meant dropping anchor in the very fast-flowing Marne to clean it out. Then when we went to pull the anchor up we found the winch wouldn’t work .. but later we managed to fix this problem ourselves. Hooray. We also had success repairing our windscreen wiper which misbehaved in our few days of consistent rain. We are still using one of two loan power chairs we’ve had to use while the Invacare service technicians have been unable to repair Stewart’s own chair (dating back to before our visit to Reims six weeks ago). The solution: Stewart has purchased a new (e-Bay) model to collect in New York on our way through to Australia. And now we have a slight problem with our black water (septic) tank which we are struggling to empty (through the mains system) due to an unidentified fault which no amount of expense, plumber, pump-out tanks or mechanics seem to be able to fix. But we’re holding out OK! And someone must be able to sort out such a basic system.. soon please! We are now back in Paris and thinking about Australia and our journey to get there. Today we are celebrating Stewart’s birthday with a little treat in store at a restaurant on the Ile Saint Louis. We will definitely be opening one or more of those bottles of Champagne, stored under Janie’s bed, before day’s end. We will toast absent friends and family who couldn’t be here with us .. and look forward with great excitement to our time in warm and sunny Australia. We’re now in the Champagne capital of the world: Epernay. Hold on.. I think we’ve said that before.. Oh yes, in our last blog! Both Epernay and Reims claim to be at the heart of this marvel of marketing: The ‘Champagne’ region of France. In fact, we are now a few miles south of both heading down the river Marne. PC Navigo map showing the route from Reims to Paris. We left Reims just over a week ago and have a short run of 238 and only 37 locks, a couple of tunnels and a swing bridge (rare in this region) into our winter port of l’Arsenal in Paris. From here (Damery) we know this stretch of water, having taken the same route last year in late November, but this year with the ‘vendanges’ (grape harvest) in full flight it’s a completely different experience. It’s buzzing with activity and excitement (more to come on this). The Cathedral and in particular for this visit (our second) the illumination of the spectacular western facade which brought the history of the cathedral to life, colouring the statues as they would have looked at their creation. The beautifully renovated classic art-nouveau covered market at Boulingrin and later the Pique-nique (picnic) beside it one night with our friends Phil and Caroline. We also loved the contemporary art exhibition taking place on the mezzanine level with works from local artist Armelle Blary. Touring one of the great Caves of this Champagne city, Pommery: First with other friends from Australia, John and Lyn and then with Jonney and Felicity (Hawkey). The Reims Port de Plaisance (marina) was excellent – despite works going on to improve the cycle and pedestrian ways (we love them), with main roads either side, but otherwise with high standards in a perfect location near the Cathedral. Visiting the Surrender Museum (Musee de la Reddition) where the German Third Reich officially surrendered to Allied forces in World War II. Last year we visited the Armistice Clearing, near Compiegne, the site of the 1918 Armistice with Germany that signaled the end of World War I. Several lovely restaurants with our favourite which included music one special night: Le Cornichons near the covered markets. A live music festival at the Forum, around the remains of the old Roman cryptoportique. Stewart, Lyn and John at Cave Pommery, after our tour and with Champagne in ready. It looks like the porta-loo is being delivered to our bow, but no (thankfully), it was beside us until we moved to a more ‘convenient’ spot. Les Halles du Bouingrin covered markets. Chateau at Reims – one of the many Champagne houses. Palais du Tau model of a vision of the ideal Reims Cathedral with spires – we prefer it as it is without. Time for a haircut in Reims, at the very good Jean Louis David, Place Myron. Not the light show, this is the Cathedral with standard night lights – still spectacular. One of classic French performers at the Forum. Stewart with the artist Armelle Blary’s contemporary art cat trap! Armelle Blary’s ‘Wheelchair’ – something Stewart strongly related to he said. Stewart at our favourite Les Cornichons restaurant – this is not a drink but the best tasting Gazpacho. Stewart at the Surrender museum. Surrender museum maps, this showing the Normandy beaches landings. Caroline with Nala, Phil and Stewart at the Reims Pique-Nique. Graffiti even on the ancient bottles of Champagne deep in the undergound cellars. Epernay .. on the other hand .. we found a bit challenging. The Port de Plaisance has few moorings available, it’s on a steep slope down to the river making it difficult to handle the wheelchair, and the mooring is a bit rough. The clubhouse is charming and the showers and toilets immaculate, but we don’t use these having everything on board. Then the town (of Epernay): a messy experience to get from our boat to the only well-maintained part of the city (it seemed to us), the Avenue de Champagne. Here is where Moët & Chandon, Perrier-Jouët and Bollinger have their headquarters. But we had only two nights here (as opposed to almost a month in Reims) and on our second day were joined by our friend Janie, from Australia. 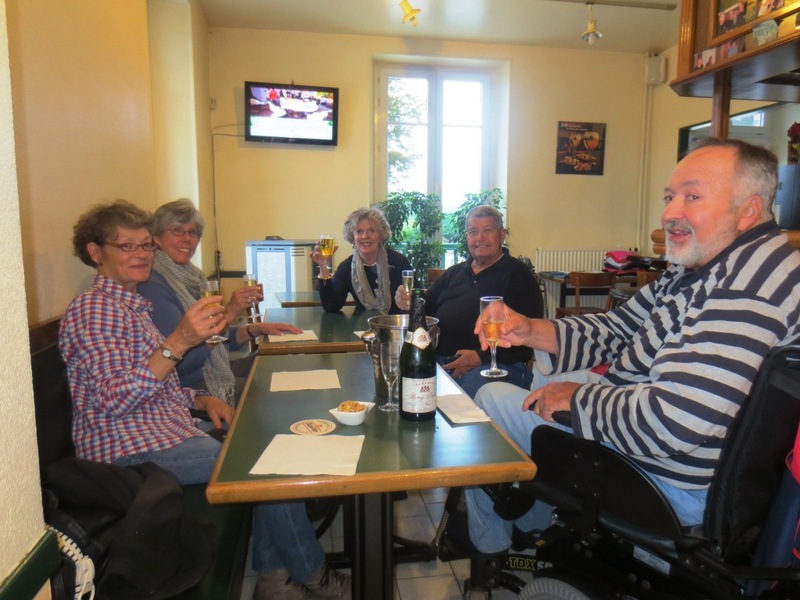 In town we visited a cafe in Avenue de Champagne for a glass of bubbly and the efficient hostess brought our half-bottle to the table and seemed to relish having to open it, ask us to taste it, and on approval pour it for us just like a top quality restaurant. It wasn’t expensive and it wasn’t Moët & Chandon which was right next door – I said “pas (not) Moët & Chandon”. Non, she said, much better, were her words (in French)! And the next day Janie took the Moët & Chandon wine tour and said it was one of the best guided tours she’d ever experienced. Epernay port de plaisance at the foot of this steep slope. In Epernay town the cycle path shares the footpath, but the trucks take over the lot! Janie arrives at Epernay station. Endellion moored at Epernay – to the left is a very steep slop for the wheelchair. The rough and dangerous road from our mooring (tucked down below on the left) to the town. In between these two competing Champagne cities we visited Sillery just 10 kilometres from Reims. 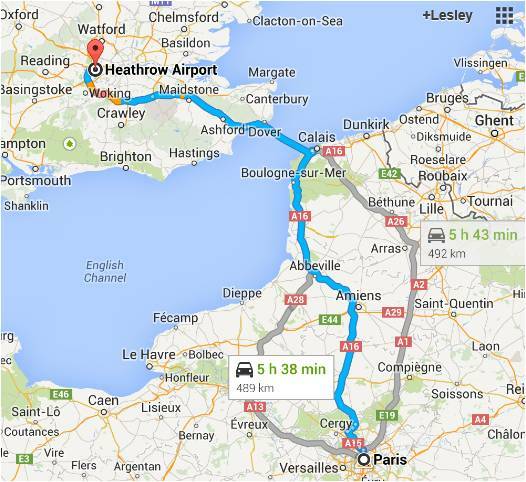 Jonney and Felicity had travelled with us from Reims, and later collected the car. Very handy as we could visit the delightful Francois Seconde Champagne house and send them back with a dozen bottles of Champers and wine for Christmas coming up. We’re planning on Christmas in Cornwall. And then Tours (sur Marne) to revisit one of our favourites, the Auberge ‘La Touraine Champenoise’ where Sylvain and his mother (“the boss”) warmly welcomed us back. Restaurant and Auberge ‘La Touraine Champenoise’ in Tours-sur-Marne. This section of our journey has been the last of the ‘new’ waterways for the year – we are now heading back down the River Marne just as we did last year but a month earlier. 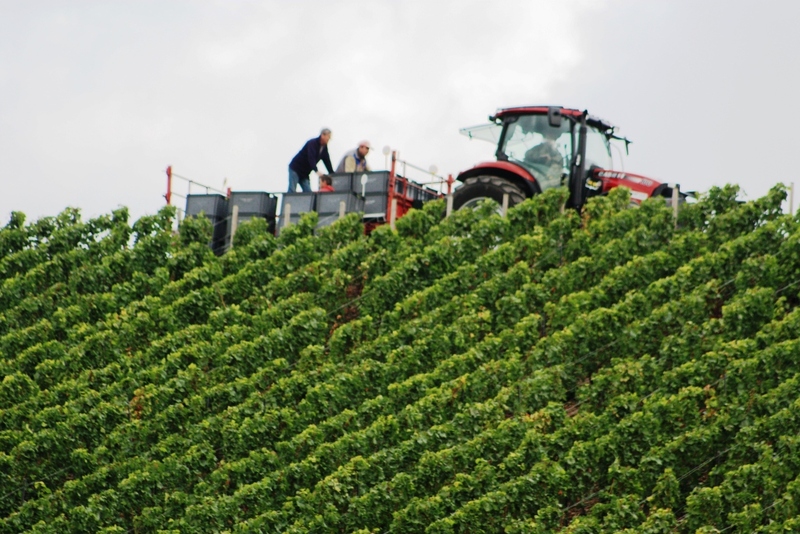 The hills around Mareuil (canal lateral a la Marne), just before Epernay – la vendange (harvest) in full flight. This means we are catching the tail end of the grape harvesting. At the lock at Mareuil-sur-Ay the vineyards creep down the hill all the way to the lock-keepers house and this year we saw the fleet of grape-pickers busy at work. Almost too busy to take note of us, one of the few boats passing by at present, until one man finally stood and waved as I took photos. The weather is warm, the Champagne excellent .. we toast the health of our friends and family.